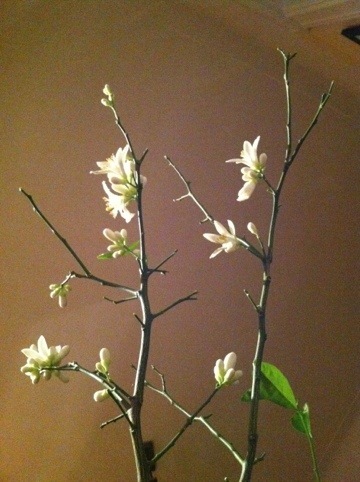 It’s something else … merely feigning death and defeat, the scent of sweet lemon tree lifted me this week. Someone I know has a small lemon tree they want to get rid of. How do you care for yours? I would imagine it likes sun, but how many hours of sun does yours actually get? It looks nice and healthy. Perhaps surprisingly, it is very much like a banana tree in terms of amount of water and sunlight it wants (although it does tend to do better with a little more sun than the banana plant). It does not like to be overly pampered though — depending on the size, just not letting it dry out, and an occasional sprinkling of coffee grounds seems to do the trick for mine. They are well worth it if you’re thinking about it. You can use the leaves in cooking for the lemon essence, and of course the lemon themselves. 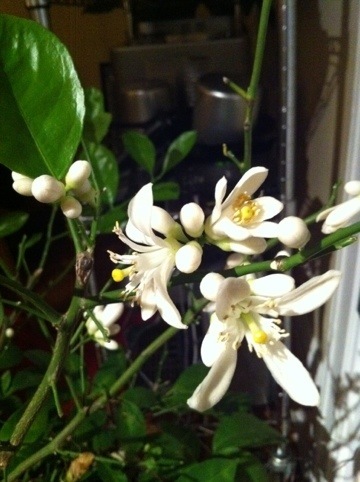 There also is simply nothing like the beautiful scent of a lemon tree blossoming. Heavenly.